But what about the other 51 weeks of the year? I work a 40 hour week, have eight grandchildren, a husband, and an elderly mother—all too quickly, the restful, relaxed feeling at the beach is gone, and life seems to quickly accelerate into its normal, fast pace. There never seem to be enough hours in the day to do all that needs to be done. So how does one find the time to rest, regroup, and recharge? The first answer to that question is “It ain’t easy.” I believe that each one of us has to search to find what best works for us individually. Below are some things that I have found helpful in my search. 1) A vacation in my mind. When things seem overwhelming, I reach into the “back” of my mind and imagine myself sitting on the beach or viewing a mountain waterfall. I think about some past vacations my husband and I have enjoyed, and I relive it in my mind for several minutes. 2) Always take your “breaks.” If you work outside the home, and “breaks” are a part of your employment benefits, then take advantage of them. This is one of my weaknesses; I tend to think I am too busy to take a break. I have recently begun to “make” myself take my breaks. Just to get up and move away from your desk/duties is beneficial. You’ve earned it, so take it. If you work at home, still try to manage a morning and an afternoon break of at least 15 minutes. It’s tempting when young children take afternoon naps to use that time to “catch up” on household chores; resist the temptation, and take a nap when they do. 3) Establish a regular bedtime. Oh my…..another one of my weaknesses. I tend to be a “night owl” and stay up at night much later than I should. As much as possible, try to adhere to a scheduled time to go to bed. Sufficient rest is essential to a successful “next day.” Now, if you are reading this, and you are a young mother with little ones that do not yet sleep through the night, just remember this–the days (and nights) are long, but the years are short. The nights with little sleep won’t last forever, and the Lord above watches over you and strengthens you as you care for those precious ones. 4) Have some “quiet time” with God. Again, not always easy to do! If you are knee deep in diapers and bottles, your “quiet time” may be only 3 minutes long—long enough to flip your Bible open, read a verse, and try to repeat it to yourself throughout the day. There is no rule that says your time with God has to be a certain number of minutes; just do the best you can depending on your situation. God will see your effort. 5) Surround yourself with peaceful things. This will be different things for different folks. For me, it’s some color pictures on my office walls that I can gaze upon—pictures of the beach, the mountains, a sleeping cat, a sunset. Several years ago, I purchased a set of miniature wind chimes. It was an impulsive purchase, and I told myself to return them since they were obviously too small to hang outdoors—a big wind would probably send them across the street to the neighbor’s lawn. But I decided to take them to work, and discovered a spot underneath my desk that was suitable to hang them. They are situated in such a way that sometimes when I swivel in my desk chair, my knee hits them, and my area is filled with that wonderful sound. It reminds me instantly of the outdoors, and has a calming effect on me. 6) Music. I am priviledged to be able to play CD’s through my computer at my desk. The volume is low, and the music I choose is ALWAYS slow, soft, and relaxing—I call it “spa music.” It works for me, and it might work for you. Even in a busy household with children, try turning off the TV and playing some soft music for 30 minutes. Consider purchasing CD’s that feature ocean sounds. 7) Water music. When one of my doctors built his new facility several years ago, he had a large water fountain installed in the lobby area. I am never conscious of how long I wait to be called back for my appointment, because of the soothing effect of that flowing water. There are small battery operated table models on the market, so consider one for your home or workplace. 8) Pray. God knows what we need even before we ask, but He wants us to ask so we will realize that our needs are being met by Him, granted to us because He loves us. Don’t be reluctant to ask God to show you opportunities throughout the day when you can rest and refresh yourself—ask Him to give you rest. 9) Follow the examples. The Gospels are filled with instances that relate how Jesus withdrew from the crowds, and even His disciples, to rest and pray. Sometimes, He boarded a boat and sailed away in order to escape and find solitude. Genesis tells us that God created the world in six days, but set aside one day for rest. Numerous verses in Psalms, Proverbs, and Ecclesiastes warn against making money (working) such a priority that we miss the more important values in life. In other words, don’t be a workaholic—remember to have some time to rest and relax. My husband and I were privileged some years ago to view a museum exhibit of seashells from around the world. The shells had been gathered from oceans all around the globe, and they ranged in size from “itsy-bitsy” to gigantic! The colors were amazing. I remember leaving the exhibit thinking that the shells I had gathered on my beach walks were plain, and in no way even slightly comparable to the magnificent, colorful shells from the Indian Ocean. When I pick up shells on my beach walks, they are usually smooth. But when they began their journey toward the shore, they were most likely rough and jagged. The combination of constantly moving water and sand work to toss and spin those shells and to smooth the roughness. 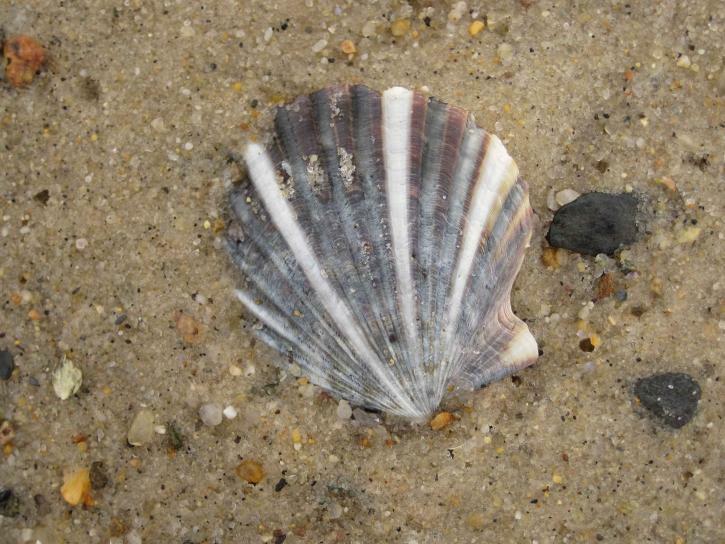 By the time a shell arrives at my feet, it has weathered water, sand, and storms before coming ashore. The shell’s journey is not unlike our own. By the time we arrive on heaven’s shore, we will have weathered some crashing waves, sand blasting, and mighty storms. Yet it is all a part of our earthly journey—a journey that we can make with some rest options along the way. I hope the above suggestions help you in your search for rest/renewal time, and you discover what will best work for you in your job or situation. If you have some sea shells tucked away in a drawer, bring them out this week and place them in a bowl or basket. Place them where you can see them and be reminded of their journey. Those shells made it to shore, and so will we. Oh, and if you are planning a visit to the beach anytime soon…..have a wonderful, relaxing, restful time. Enjoy the sand, sun, shells, and blue water! !